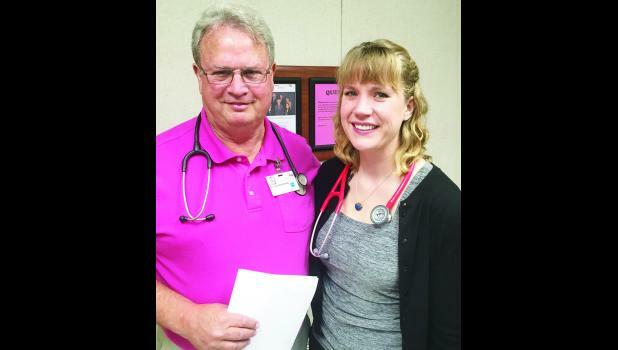 Anne Valburg, a 2000 graduate of Holton High School, is completing an eight-week rural family medicine rotation with Holton Family Hospital and Family Practice Associates. Valburg is in her last week of working alongside Dr. Joel Hutchins, Dr. Malia Warner and Dr. Clint Colberg at the clinic. She is the daughter of Lonnie and Isabelle Valburg, who own a cattle ranch west of Holton. After high school, Anne studied at The University of Kansas while also working full-time at Walmart. Valburg said she found her true calling after noticing her reading habits. Valburg is currently studying at The University of Kansas Medical Center. She will graduate in 2018. She said she wants to specialize in either internal medicine or family medicine. Two of her siblings are also in healthcare. Her sister, Lisa, is a surgery nurse, and her sister, Rebecca, is a pharmacist.